Is your Valentine a bookworm? My son has become one in the last few months. It was a struggle to get him to read at the beginning of 2nd grade, but once he found books he likes, he can't get enough. He reads in the car on the way to school. He reads on the bus. He sneaks in a read in the moments just before his nightly "tuck in"....I think I shall craft him a Valentine Bookmark. Craft your bookworm a sweet corner bookmark out of heart printed paper. So sweet....so easy. This one seems to be right up J's alley as far as "cool" goes. One must remain cool in the 2nd grade. No girly bookmarks, just cool ones. I think the corner bookmark is the way to go for him. Heather at The Creative Homemaker has a super simple tutorial. Check it out...they have several adorable ideas, search their Valentine posts for more. Amy gets my heart strings everytime I browse her site! She's so talented...and offers some of her designs for FREE! 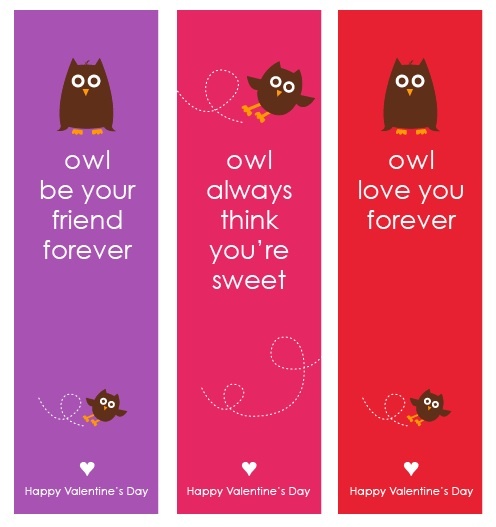 Like these oh so sweet owl valentine bookmarks! 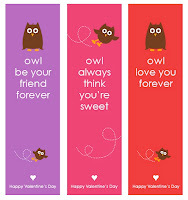 Download the PDF, print on cardstock, add a ribbon or don't add a ribbon, adorable either way! I ♥ owls. I ♥ Amy at Living Locurto. I have to admit, this ones just for me and my heart. Maybe the teen B will ♥ owls too. These Rose Bookmarks look complicated...but don't let them scare you. The petals are hearts! Disney Family has the full step by step guide...plus more of your favorite Disney Character crafts... you can thank Belle for the Rose Bookmarks. Too young to read yet, but little Bug will appreciate a pretty flower to hold, then pull apart as curious lil Bug's tend to do.